Lunch will be a traditional ‘dinner on the grounds’. Local singers, please bring a dish to share. $20 donation to help cover costs (or whatever you can afford). Karen Willard is an experienced alto singer, singing school teacher and shape-note music publisher from Seattle. This is a rare opportunity to learn from one of America’s best-known singers! Shape Note singing is loud, participatory, a capella folk hymns sung in four-part harmony. There are no rehearsals or performances. We gather to sing in friendship and for the joy of the music. 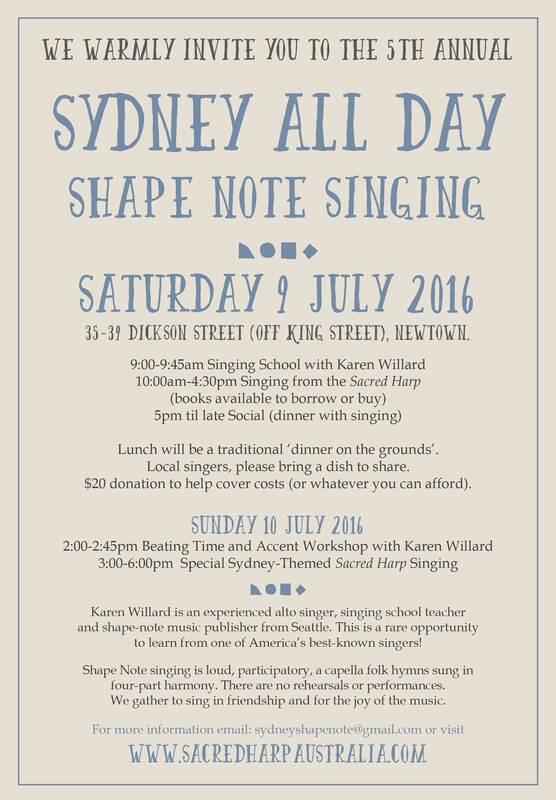 The Sydney All Day Singing was held on Saturday 25 July. 60 songs were sung, 15 different leaders, representatives from Portland USA, UK, Melbourne, Canberra and Sydney. With 24 singers in attendance it was a wonderful day of rousing sound. Thanks to all who came and sang and helped to make it happen.